Miami (Monday, September 24, 2018) – The Confederation of North, Central America and Caribbean Association Football (Concacaf) today announced that the 2018 Concacaf Nations League Qualifying match between Martinique and British Virgin Islands, which was postponed due to Tropical Storm Isaac, will take place Tuesday, October 16, 2018 at the Pierre Aliker Stadium, in Fort-de-France, Martinique. Earlier this month, after consulting with local officials and both participating Member Associations, Concacaf announced that to guarantee the safety of the delegations, as well as all participants and fans, the qualifying match would not take place as originally scheduled. 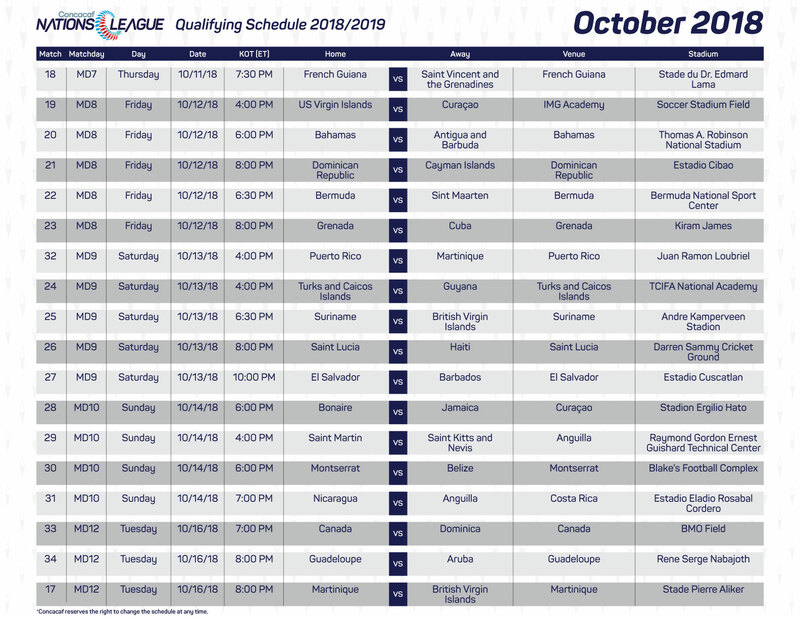 The schedule for the Concacaf Nations League Qualifying week two, which includes the postponed week one match between Martinique and British Virgin Islands can be found here. Following all 68 matches of the Concacaf Nations League qualifying phase, the total points for each team will be compiled into an aggregate table, ranking the participating teams from 1-34 based on their on-field results. The final standings of the qualifying phase will determine how teams are placed into Leagues A, B and C for the inaugural Concacaf Nations League Group Phase, set to kick off in September 2019. The Concacaf Nations League is a new centralized men’s national team competition representing a new era of national team football for Concacaf Member Associations.